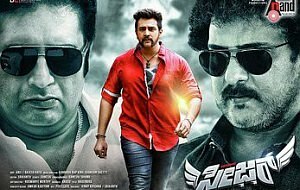 For the first time, Crazy Star V. Ravichandran will be seen alongside Yuva Samrat Chiranjeevi Sarja. Touted to be an out and out action entertainer, Seizer, assures to be perfect cat and mouse fight between protagonists and a powerful antagonist. Seizer is based on the director’s real life incident which happened way back in 2010 and at that point of time did he feel the need to convert that real life incident into a reel life celluloid.